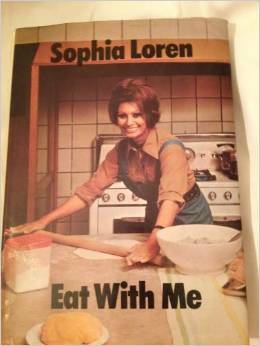 My dad once told me that when he was younger, Sophia was his favourite pin-up. Is it any wonder? Those two are pretty pricey to buy, but this one is more affordable, and a new edition was released just last year. Her pizza recipe follows. 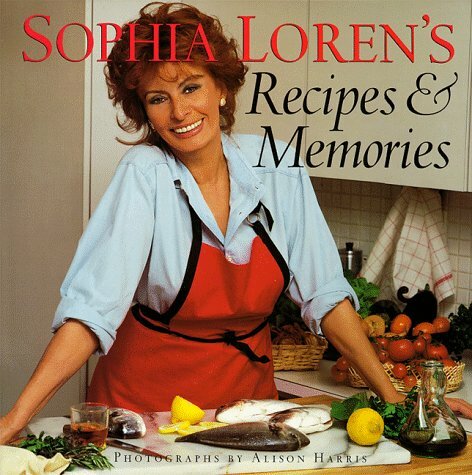 This recipe was given to Johna Blinn for her “Great Performances in the Kitchen” book. I overcooked it a bit as I was chatting to guests and a bit merry, but it was still lovely. Place flour and salt on board. Add dissolved yeast. Knead thoroughly, add oil, continue kneading until smooth. Place in lightly greased bowl, cover. Set in warm place about 3 hours, or until dough doubles in bulk. Flatten, roll out dough into a 10 inch thick disk, about 1/4 inch thick. Spread surface with your choice of garniture. Heat olive oil in large cast-iron skillet. When oil is sizzling, add pizza, cook over medium flame about 10 minutes until golden and topping is bubbly. Serve immediately. 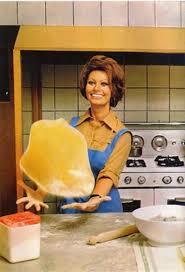 ** I used quite a lot more flour in order to make a pliable dough so you might need to have extra handy. I found this pizza dough quite wet, but that’s maybe as I was using 00 flour rather than just good old plain flour. 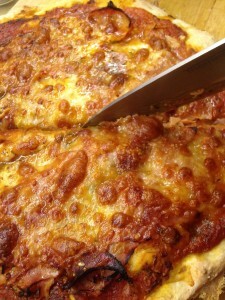 For mine I used proscuitto ham and I baked it in the oven rather than doing it in a frying pan. Yum. 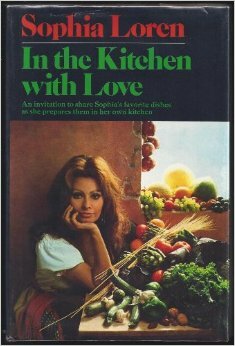 Anyhow, Sophia card was pulled from the pack for recipe of the month for March so I’ll have fun deciding what to make for that! 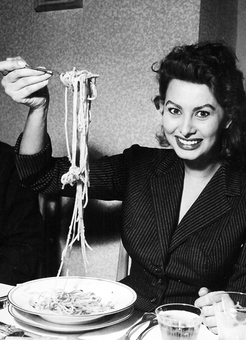 I ‘aven’t ‘ad a decent meal since Nineteen-Forty-Four! That’s all you ever say! And skinny as a rake! Well then, give us a bash at the bangers and mash me muvver used to make! Give us a bash at the bangers and mash me muvver used to make! That’s all I’ve ‘eard for years! It’s comin’ out me ears! You’ve got to fill your belly, Joe! Ah, give us a bash at the bangers and mash me muvver used to make! Nineteen-Forty-Three, Allied Forces land in Italy! There’s a smashin’-lookin’ bird over there, Bert. I think she’s showin’ out there. Well, why don’t you chat ‘er up then? Right! Bongourno Signorina now. ‘Ere, are you married? There y’are. Can’t ‘ave a fairer answer than that, can ya! That’s all you ever say! Ooohhhhh! You’ve a-got to fill your belly, Joe! Well then, give us a bash at the bangers and mash your muvver used to make! 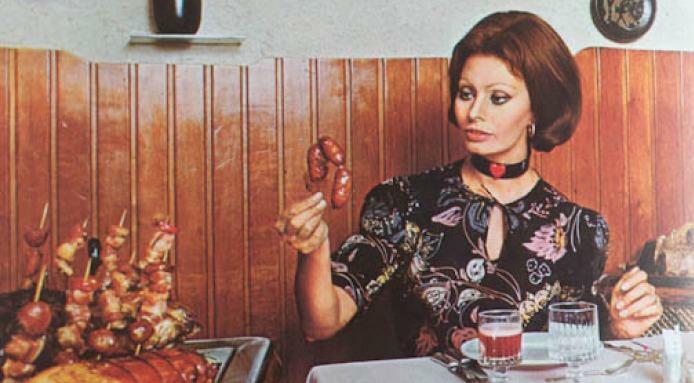 Give me a bash with the bangers and mash! Like the same one what your mother was! What you laughing at now?
. . . . . Please! I wish I had one of those Sophia cookbooks! 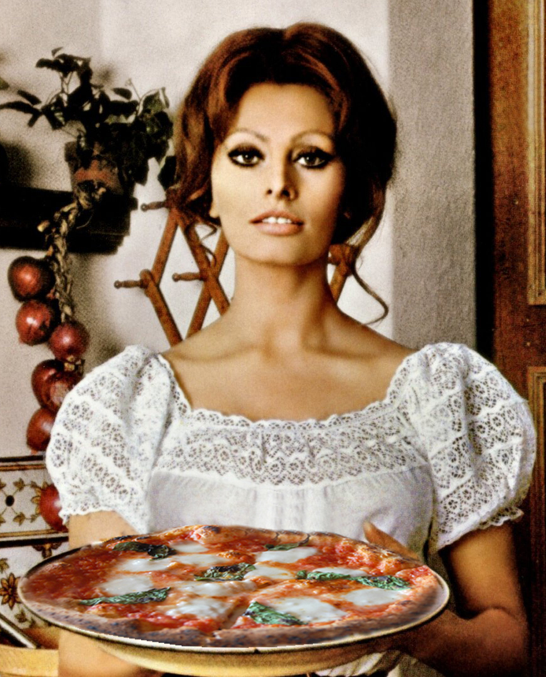 Can you tell me if you know where I ca purchase the print that has Sophia Loren holding the pizza. I would love this print in my new shop. Hi Cathy – I’m really sorry but I’m afraid that I just found that photo on the internet and used it in my post. I guess you might be able to find out who the photo belongs to by googling? It really is a fabulous photo isn’t it? !